At least 81 reporters were killed doing their jobs this year, while violence and harassment against media staff has skyrocketed, the world's biggest journalists' organization says. The number of deaths as of Dec. 29 was the lowest in a decade, down from 93 in 2016. 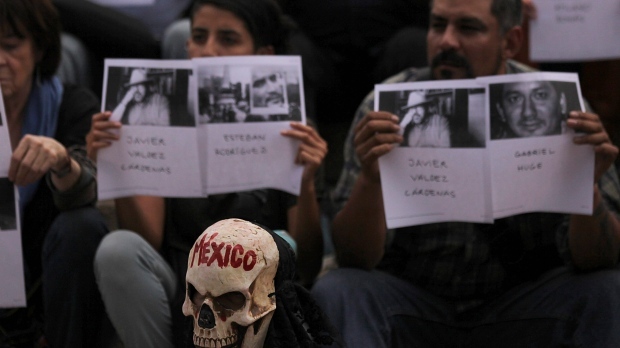 The largest number were killed in Mexico, but many also died in conflict zones in Afghanistan, Iraq and Syria. Eight women journalists were killed, two in European democracies - Kim Wall in Denmark, who died on the submarine of an inventor she was writing about, and Maltese investigative journalist Daphne Caruana Galizia who was blown up by a bomb placed in her car. Turkey, where official pressure on the media has been ramped up since a failed coup attempt in July 2016, is becoming notorious for putting reporters behind bars. Some 160 journalists are jailed in Turkey - two-thirds of the global total - the report said. The organization also expressed concern about India, the world's largest democracy, where it said that attacks on journalists are being motivated by violent populism.